336 pages | 15 Color Illus. | 55 B/W Illus. In the care of pediatric patients, infectious diseases comprise over 50% of the clinical diagnoses. For this reason, it is essential to have a basic understanding of infectious processes and to keep abreast of new developments in the field. 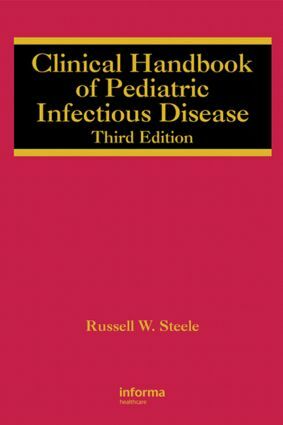 This reference stands as a convenient and time-saving reference for clinicians on the diagnosis, treatment, and prevention of pediatric infections diseases and is completely updated to include the latest guidelines from esteemed societies such as the Infectious Disease Society of America, the Centers for Disease Control and Prevention, the American Thoracic Society, and the American Academy of Pediatrics. "…a reliable and concise manual that condenses essential information related to diagnosis and treatment." "…The editor is a well-recognized authority in the field…Broad categories of pediatric infectious diseases from laboratory diagnosis to infections by system and antimicrobial therapy are covered satisfactorily. The text is clear and succinct. Its strength lies in the management protocols and tables (differential diagnosis, etc)."